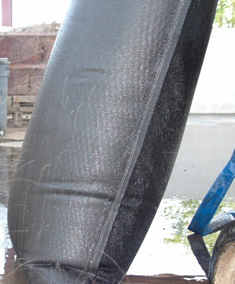 Our Wash Bay Solids Settling Bags help control costs associated with solids removal from wash bay sumps. Securely fastened to the end of a discharge pipe or hose, the bag slows down the flow of the incoming water, allowing the suspended solids to remain in the bag. Over time, the bag releases the water. Once the sediment-laden bag is de-watered, a front-end loader can easily pick it up and easily dispose of it according to local enforcement agency regulations. The fabric is comprised of a heavy non-woven, high strength polypropylene geotextile and double chain stitched for extra security. Non-woven geo-textiles filter soil particles from drainage systems and stabilize roadways to increase the performance life of these structures. Non-woven geo-textiles are approved by many local, state and federal agencies, including the Federal Highway Administration, U.S. Army Corps of Engineers, the Environmental Protection Agency and AASHTO. We offer a range of sizes and auxiliary wash equipment that can be engineered for your particular application.